The City of Birmingham Mayor’s Office Division of Youth Services (DYS) proudly announces that once again Birmingham is being honored with a 2016 Playful City USA designation for the 6th time! Celebrating its 10th anniversary, the national recognition program honors cities and towns across the country for making their cities more playable. This year, 257 communities from across the country were recognized as a 2016 Playful City. These family-friendly cities were selected for their leadership in making it easy for all kids to get balanced and active play in their neighborhoods, and have committed to integrating play as a solution to tackle a number of challenges plaguing our society in ways that benefit kids growing up in poverty. Birmingham is being recognized for making a commitment to play and physical activity by developing unique local action plans to increase the quantity and quality of play in the city. Some of these programs include the Youth First NObesity Expo, Summer Sports Series, Take a Child to the Doctor Day, Harvest Festival and many, many more. DYS is one of the only youth focused governmental departments in the country that provides programming tailored to getting kids active. Communities across the country are creating innovative ways to bring back play and attract residents through family-friendly activities. Interactive sidewalk art, designated play spaces on trails and the transformation of schoolyards into active play areas are just a few examples of how cities are becoming more playful. 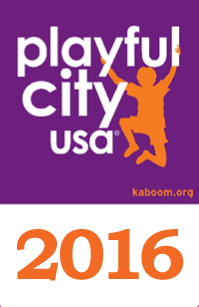 To learn more about these cities, see the full list of the 257 communities named 2016 Playful City USA honorees, or to gather more information on the Playful City USA program, visit www.playfulcityusa.org. We also encourage you to take part in the conversation on #playability with these thought leaders on Twitter and Facebook.